This is a lip balm recipe that will keep your lips moisturized as we go into Fall and then Winter. Amy of A Blossoming Life uses chamomile which is a very calming herb. She also uses lemon essential oil which gives it a wonderful scent. It’s a very simple recipe to make. Amy’s directions are very clear. I personally love the combination of Lemon and Chamomile. 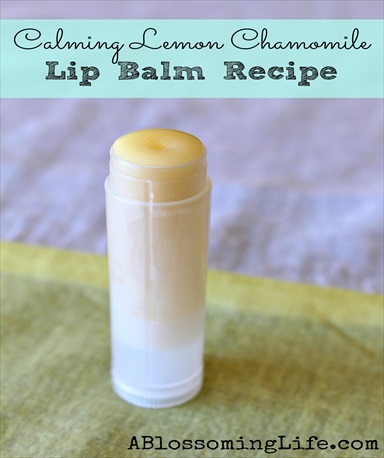 Click on the Homemade Lemon Chamomile Calming Lip Balm Recipe link below to see the complete recipe.